One work dominates Jeff McMillan’s installation at Peer. 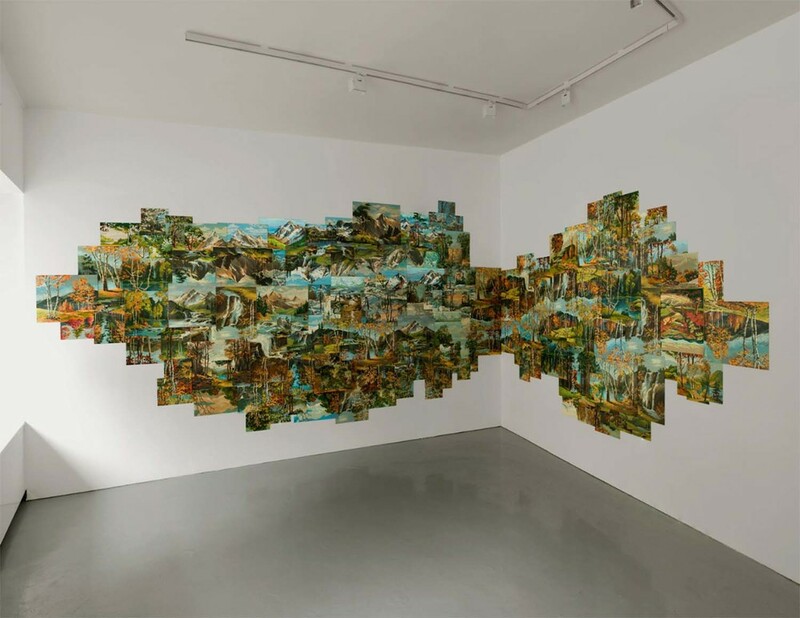 A wall construction made up of nearly two hundred individually painted landscape scenes presented in a carefully ordered mass appear to migrate across two of the three gallery walls, as if attempting to envelope the space. The work is made entirely from paint-by-numbers paintings popular in North America in the 50s and 60s and acquired by McMillan over the last 15 years from thrift stores, or more recently on eBay. The title of the exhibition, The Possibility of an Island, is also the title of this work, and suggests both a self-contained autonomy and a sense of isolation. Many of the landscapes in these pictures are similar or repeated, many overlap, some are upside-down; the process of their meticulous arrangement reveals McMillan’s interest in and enjoyment of the formal aspects of line and colour, pattern and dislocation. 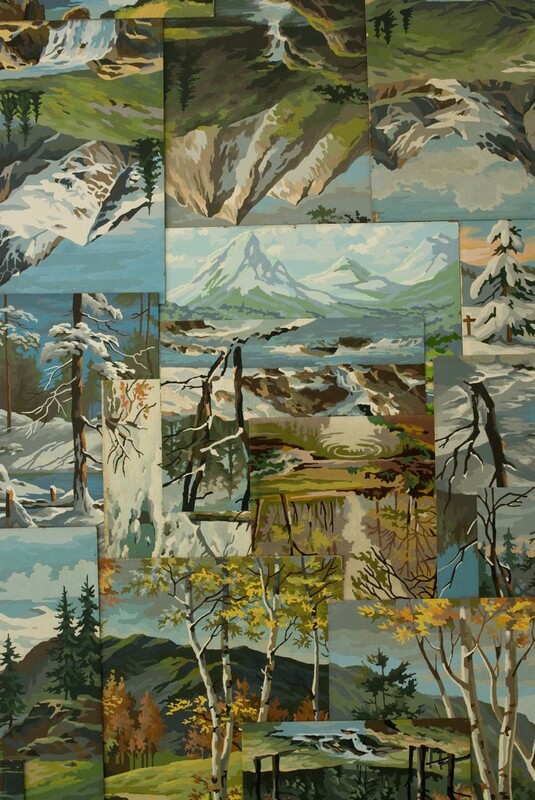 Gradually, however, one notices that he has been careful to edit out references to human or animal presence in the landscape; the slavishly coloured-in cabin nestling in the woods, the picturesque rickety fence, the enchanting deer have almost all been obscured by other paintings, leaving an unadulterated, pre-lapserian view of the world. McMillan presents a picture of unsettling restfulness that is almost too quiet. This work can also be considered in the context of the tradition of American landscape painting and notions of the romantic sublime. Implicit in McMillan’s process of making is the suggestion of its continued evolution – this vast, untouched wilderness is potentially endless. In the other, smaller work in this exhibition McMillan again takes a ‘found’ painting as his starting point, but these are singular pieces, one-off amateur paintings on canvas rather than a mass-produced DIY version. Through a process of pushing the canvas into a solid colour of paint, the artist literally and pictorially produces a new picture plane while obscuring some or even all of the original image. Again, notions of the sublime can apply, but this time the reference is closer to the tradition of the monochrome and colour field painting than to the aspirational majesty of the American landscape. In both groups of works McMillan begins with an act of appropriation, then via a process of assembling or dipping, a complex and redemptive transformation takes place. Jeff McMillan in conversation with writer and broadcaster Louisa Buck on Wednesday 15 July at 6.30pm. Download an interview with Jeff McMillan by Darian Leader here. A fully illustrated 16 page booklet with an essay by Dr Richard Noble (Head of Fine Art at Goldsmiths) and an interview with Darian Leader (writer and psychoanalyst) is available. Click here to buy a copy. To raise funds for PEER's programme Jeff McMillan generously produced Beggar's Joy a limited edition of 35 hand-dipped prints, which has now sold out. In 2013 the artist produced a new series of eight found etchings, dipped in ink. Each is unique. Framed and signed on the back. Click on the titles to see and buy available works: work 1, work 2, work 3, work 4.